Public service values are too rarely discussed in public administration courses and scholarship, despite recent research demonstrating the importance of these values in the daily decision making processes of public service professionals. A discussion of these very tenets and their relevance to core public functions, as well as which areas might elicit value conflicts for public professionals, is central to any comprehensive understanding of budget and finance, human resource management, and strategic planning in the public sector. 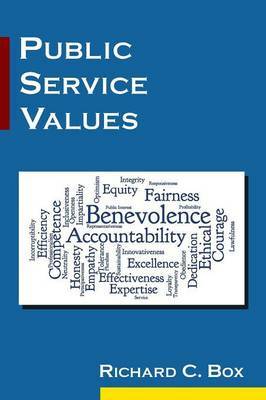 Public Service Values is written specifically for graduate and undergraduate courses in public administration, wherever a discussion of public service ideals might enrich the learning experience and offer students a better understanding of daily practice. Exploring the meaning and application of specific values, such as Neutrality, Efficiency, Accountability, Public Service, and Public Interest, provides students and future professionals with a `workplace toolkit' for the ethical delivery of public services. Well-grounded in scholarly literature and with a relentless focus on the public service professional, Public Service Values highlights the importance of values in professional life and encourages a more self-aware and reflective public practice. Case studies to stimulate reflection are interwoven throughout the book and application to practice is cemented in a final section devoted to value themes in professional life as well as a chapter dedicated to holding oneself accountable. The result is a book that challenges us to embrace the necessity of public service values in our public affairs curricula and that asks the important questions current public service professionals should make a habit of routinely applying in their daily decision making.